Glen C. Sheffer (1881 – 1948) was an American visual artist whose artwork focuses mainly on illustrations. 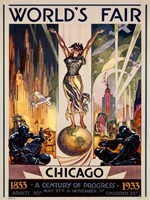 He is best known for the poster he created for the 1933 Chicago World’s Fair poster, which earned him instant fame. His paintings capture landscapes, human portraits, structures, and a host of other subjects. The diversity of his artwork makes them appeal to different people from diverse backgrounds; something that has contributed immensely to his fame. Owing to his painting prowess, he got contracts to illustrate for a number of publications, including Kappa Sigma Fraternity and Frank L. Baum's The Fate of a Crown. The rarity of his works and their quality has seen a number of them auction at prices above $1,000. Sheffer studied at Denison University, a privately run liberal arts college located in Granville, Ohio. He was also a student at the American International College, American Academy of Art, among others. His works were and are still being exhibited in different locations across the globe, including Detroit Institute of Art and Palette and Chisel Club. Sheffer became a member of several bodies such as Palette & Chisel Club, Scarab Club, and Cameo Salon, simply because of his constant involvement in matters art. In all these bodies, he served in different capacities, making it possible for him to inspire other painters and illustrators. To date, Sheffer’s works are still being used as reference points due to their depth, quality, and diversity in content. As such, his artistic legacy still powers on!